There is a certain amount of dissatisfaction involved when you have trouble with Babylon roof leaks. It is the same type of dissatisfaction you have when there's not enough space in your home and you need to add on. Everyone wants to be comfortable in their homes. 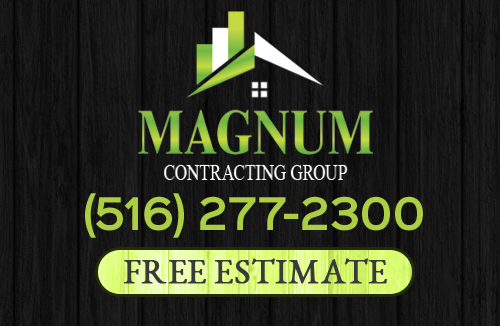 If you're not happy with roof damages or the space in your home is too tight, you can take care of it by calling Magnum Contracting Group. Our Babylon roof repair experts have the experience and equipment needed to restore your roofing system. We can repair or replace your roof no matter what caused the damages. Rest assured that we will get the job done quickly and correctly. We work with your insurance company to get you the most out of the claim. There are many ways we can improve your Babylon home. The kitchen and bathrooms are the place where most people choose to start. This is a great idea because this is where most home owners and family spend so much time. Value is quickly added to a home when the kitchen and bathrooms are remodeled. Another great idea is to remodel the basement. If you need more space, it's the best place to start remodeling. Whatever changes you choose to do, we're ready for the project. Magnum Contracting Group is the Babylon remodeling team to call. You'll love how we manage the project completely, all the way through to the time you tell us you are amazed at what we could do. If you are looking for a professional Babylon roofing contractor or remodeling company, please call 516-277-2300 or complete our online request form.